Moved from 3-3 point invasion. Agt: What if Black plays instead of - Should White play then ? Andre Engels: For White to play at is a possibility: whether it is good depends on the situation. White is giving away the corner for a position on the side. One cannot in general say which is better. In many cases the best answer to would be the docile response at . If Black next plays at , White plays at , and has a better result than by answering at immediately (White almost is guaranteed two eyes already). 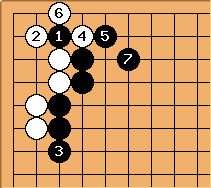 If instead Black switches to , as here, capturing with provides better shape than the normal joseki would do.